Post news Report RSS	Steel Legion for DOW:Soulstorm released. 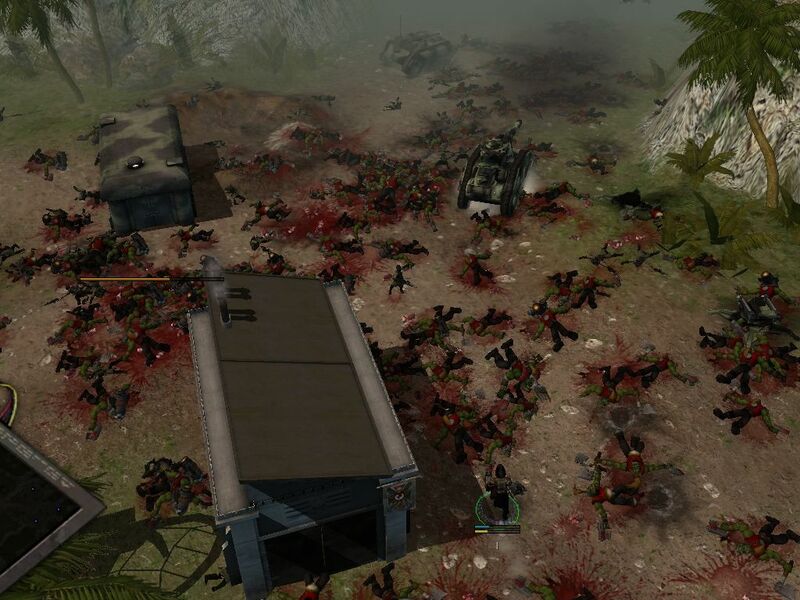 As a member of the "SL for SS" conversion mod team, with Respect to the Community and to the original mod Creators, I want to post here a little bit outdated "news" about the 'Steel Legion for DOW:Soulstorm" mod was finally released at 23 Dec 2010. With new features specific to SS, lots of fixes and improvements. Steel Legion will fire on the aircraft? Не понял..., вполне уместный коммент, так как стальной легион не способен вести огонь по самолётам в Soulstorm. Я же извинился! Не привык ещё к интерфейсу, не в первый раз уже промахиваюсь. Версия "SL для DC" в SS не стреляла по самолетам и не работал ИИ. В этой новой версии - всё ок. По самолётам стреляет, ИИ соответствует моду Advanced AI 3.2, баланс поправлен на соответствие балансу SS и DC 1.2, т.е., к примеру, продвинутый термогенератор не построить до второго тира. Но, между нами русскими говоря, косяки в моде остались. Я работаю над этим, но уже в одиночку. Исскуственный интелект радует в данной части, у меня даже получилось затолкать в "Combiner Mod" новую версию), наконец-таки на русском языке мод, вылеты только к сожаленью изредка случаются, а так всё работает. hey a jones where is BTmod for your game? Да, вылеты есть, как люди выяснили, из-за модели тарантулы. Грят, если вместо неё подставить другую модель, обычной реликовской турели, то вылеты прекращаются. К сожалению, я без понятия чем игре не нравится модель. Слишком эпизодически вылетает. А то бы я попробовал "починить"
I learned that SL for SS will be a beta version, the team seem to be working on it. My question is will they have flyers? Will they work with the Apocalypse mod? which will be awesome! The team developing the SL beta please come out and let us know, I want to play SL against the Tyranids. No, that (23th Dec 2010) was a kind of final public release for SS. No further work in progress by "team". Personally, I'm in development of expansion side project, where also a goal to fix bugs and inconsistencies of the "final" SL for SS release. Sorry, no flyers expected currently, because of bugged flyers implementation in game in general. About APOC mod: There is a APOC team decision do not include SL mod in theirs expansions projects, at current time at least. WEll it has been a while and I have played SL on SS, can you let us know if updates coming soon. Once this mod was converted to DC and SS it well pretty downhill to be honest. The Infantry Doctrine makes sence with the amount of upgrades you can give them, but the Mechanised Doctrine is pretty crappy, since you can only have 2 Leman Russ varients and a Tank Ace. How is that an Armoured Doctrine? I did notice you can spam Hellhounds.....but it's not very good! The Winter Assault version was amazing! Could could have a decent amount of troops, decent upgrades and alot of tanks! Which is what the Steel Legion are! They are an Armoured Infantry army! Personally if someone were to pick this mod up, dub down the pop of each Leman Russ, Destroyer and Thunderer (pop is a little stupid for how bad they are), remove the Leman Russ build cap for the Armoured Doctrine etc. It should be balanced against vanilla factions, btw, where for example, IG can build just 2 Leman Russes on the Tier4 only. Disagree, at first you should understand what fundamental changes were done in transition from WA to DC/SS and WHY. WA extremely streamlined the gameplay turning it into techfest where you´ve just spammed the most powerful unit available. It removed depth game had and made lower tech unit issues even more problematic (being useless later). The WA version was build around this and since DC changed the gameplay a lot it had to adjust to it´s gameplay as well. The elite stuff was tweaked and hardcapped to keep their elite feeling and lower tier units usable (prime example are Chaos Raptors/Khorne Berzerkers/Possessed Marines). If you understand this you should understand why ideas like removing LR buildcap are just terrible (to me it looks like you just want to spam few units to get the WA feel). And besides none of Leman Russ variants are that bad to lower their cap (it´s quite opposite case but whatever). Most of issues you posted are done in order to stay balanced and well playable against vanilla races and that´s what matters. Sure some numbers can be always adjusted but expecting big changes like those you´ve suggested might leave you being disappointed. I know why they but such a limit on the amount of Leman Russ' when they transitioned into DC and SS simply due to balance, however I still stand by the fact that the Armoured doctrine should allow more Leman Russ' than normal simply because you get a smaller infantry pool and a larger vehicle pool. Maybe increase the build limit of Leman Russ varients by 2 and decrease the pop limit by 1 (which make a Leman Russ 4 pop instead of 5) which makes up for the lack of infantry since other armies will have more infantry giving them increase firepower. I also think that Leman Russ' should also get their side sponsons back as a purchasable upgrade, like in WA. If conjunction to our post about it looks like I want to spam units like in WA, you couldn't be anymore wrong! I just want more powerful vehicles for the Armoured doctrine, agreed you can still have a Stormlord, 2 Leman Russ's, 1 Tank Ace and 2 Destroyers....but that is your entire vehicle pop? How is that the "Armoured Doctrine"? Since Imperial Guard can take a Baneblade, 2 Leman Russ', heavy weapon teams with lascannons and it will completely counter your entire SL build. I do feel that the Steel Legion are missing some of that "Pushing power" that most races have! I remember me and my friend was playing a "Harder" difficulty game on Into the Breach against double Orks. We could easily defend the breach with the amount of tanks, but we just couldn't push due to the constant stream of units!. Most of Vehicles your SL composition provides is created from T3-T4 Tanks which are powerful enough to stand on it´s own against similarly based armies on the same level. SL do have lower INF cap (15) but higher vehicle cap (29) and fact that you want to be able to pump out more of them without some payback is wrong. It makes sense like if I said I want to remove cap from Relic units since they already take some inf/veh cap (ignoring SoB LS and Eldar Avatar), how could this affect the game ? In similar way like your suggestion, this + being unhappy about how HH spam is ineffective was the reason why I ,,accuse you". ...And at last your example: It´s just bad example and heres why. Into the breach works as bench for brute balance force, if you or your opponent gets steamrolled, there could be an issue (since you can´t factor stuff like mobility and alternative routs it´s just an possibility), otherwise if it ends with stalemate, it´s a good sign of decent balance. It´s nearly impossible to win past early game on that map unless you get some early game advantage (or being able to somehow attack ,,from behind") because later theres great defenders advantage (number of units able to defend is bigger than number of units being able to move through valley and attack because much better arc you can use). I can look at it from opposite perspective and say that Orks even with Eco advantage! couldn´t break your lines so the problem could be an exact opposite thing (since you could defend easily). Personally I could imagine Jones adjusting number of available LRs (to get more DoW vanilla campaign IG feel) but I doubt it comes without compensation, without the price because from my point of view SL aren´t underpowered (it´s bit more the opposite thing) and don´t need such extra help. But we will see. The latest 2010 release was for Soulstorm only, not for DOW:WA. There is probably extremely old SL mod for DOW:WA, somewhere in internet, but I cant' help you to troubleshoot it, sorry. is this compatible with the latest apoc mod 1.73.9? It is compatible with the latest Dawn Of War Soulstorm! The compatibility with Apoc mod is the problem of Apoc mod team.